Add-on lenses and battery packs are common purchases for photographers pushing the most out of their smartphone cameras, but a company called Moment is combining the two into a single accessory for the iPhone 7 or iPhone 7 Plus. The phone attachment maker has launched a Kickstarter campaign for the Moment Battery Photo Case - a power pack with a socket compatible with its line of smartphone photo lenses, furthering the already-impressive camera capabilities of Apple's smartphone. The Moment Battery Photo Case sports a 3500 mAh capacity for the iPhone 7 Plus version and a 2500 mAh for the iPhone 7 model, meaning users should easily get a full recharge from the add-on pack. 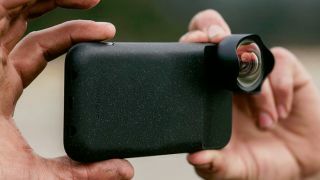 The case also has a Lightning connector-powered shutter button on the side, allowing a more tactile way to shoot steady photos without thumbing an awkwardly placed volume slider or touchscreen button. You can also alter the Battery Photo Case's charge settings using the official Moment app. That isn't the only photography enhancer Moment is currently crowdfunding, as those more interested in the company's lenses than the extra juice can also back a battery-less Photo Case (pictured above) for the iPhone 7 or iPhone 7 Plus. For those with the iPhone 7 Plus, both crowdfunded cases work on the standard 12MP wide-angle camera and the secondary 12MP telephoto camera that comprise the Plus' dual-camera setup. If you pitch in to Moment's Kickstarter, you can snag a case of your choosing as well as a selection of lenses, straps, and other accessories as perks, depending on your contribution level. You can get into the lowest backer tier for the Battery Photo Case with $79 (about £60/AU$100), and its intended retail price is $99 (about £80/AU$130). Backing the regular Photo Case is worth just $25 (about £20/AU$30), and it will retail for $30 (about £25/AU$40) after launch. Early backers also can also save an extra $10 and $5, respectively, though those tiers are first-come, first-served and in limited quantities. If you're motivated to fund the cases, we suggest you act fast as Moment only has until April 8 to meet its $500,000 goal. The Kickstarter is available to customers outside the US, though they will have to pay any applicable shipping and import fees ahead of time.